USB gadgets are always taking gadgets to a whole new level of bizarre, well this little sheep is no exception. The USB Seamour Sheep lamp is created after the Seamour Sheep online comic series. Although if you do pick one up, all anyone is likely going to notice is that you actually paid money to have a green glowing radioactive sheep. Which puts you on a whole different level of geekdom. The sheep with the excessively lazy expression also happens to come with a set of removable goggles. With the goggles it does make the little guy seem a bit cooler, leaving you looking like slightly less of a dork. To get the lights to shut off just knock him over on his side and the strange green glow goes away. Making it appear as if the sheep has finally croaked after years of exposure to all those radioactive chemicals. It is USB powered and currently being sold on Rotofugi. 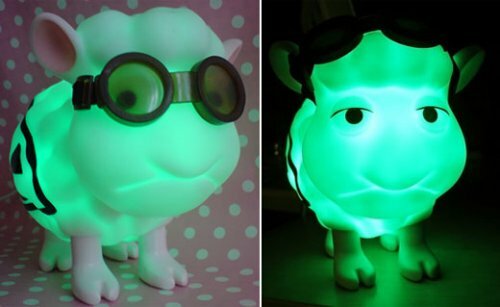 To pick up the Seamour Sheep Radioactive USB Lamp it will cost you $69.